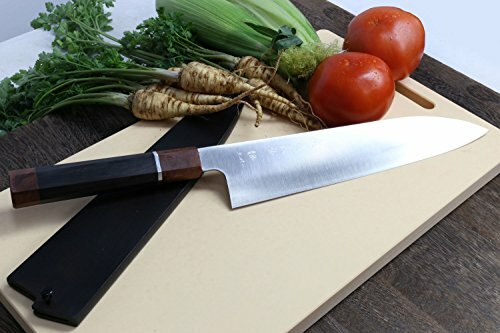 Yoshihiro Super Blue High Carbon Steel Stainless Clad Gyuto Japanese Chefs Knife Ebony handle with Sterling Silver ring, with Nuri Saya Cover 10.5'' (270mm) by Yoshihiro at Sara Stage. Hurry! Limited time offer. Offer valid only while supplies last. Super Blue High Carbon Steel with a hardness on the Rockwell scale of 64-65 is considered to be the top of its class in high carbon steel metallurgy. Super Blue High Carbon Steel with a hardness on the Rockwell scale of 64-65 is considered to be the top of its class in high carbon steel metallurgy. It is ranked above Blue Steel #1 and is second to none in hardness and edge retention. It is sandwiched in between stainless steel in the traditional Warikomi style to add to its durability and ease of maintenance. It takes a very high degree of skill to create knives of such exceptional performance and exquisite beauty with a steel of this caliber and is a testament to the extraordinary skill of the artisans. Our Yoshihiro Aogami Super Blue Steel knives are complimented with a traditional Japanese style handcrafted Premium Ebony handle with Sterling Silver ring and double bolster equipped with a protective wooden sheath called a "Saya," which protects the knife and adds to its appearance when not in use. The Gyuto knife is one of the most essential of traditional Japanese knives and is a powerful component in the repertoire of many chefs.